Jacki Rickert and Gary Storck spent the week of October 17-24, 1999 in Washington, D.C. The two joined the Cheryheart Project's Jim and Cheryl Miller of Silverton, New Jersey in an effort to dramatize the need for legal access to medicinal cannabifor sick, disabled and dying Americans. Logistical support including nearly live updates of the cherylheart.org website was provided from a distance by Cherylheart Project webmaster and communications director Gary Sage, back home in New Jersey. 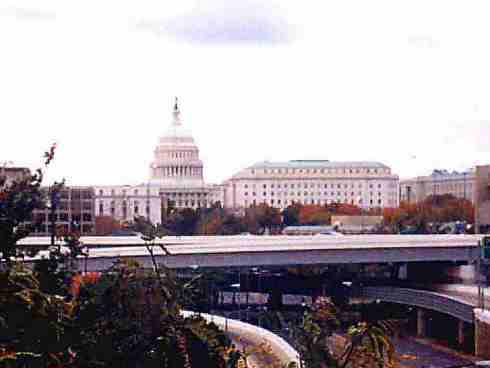 The visit was a combination of meetings with members of Congress and staff along with direst political action at Rep. Bob Barr's office on Thursday October 21, 1999. Along with representatives from the Marijuana Policy Project and members of SSDP and other groups, Jim, Cheryl, Jacki and Gary staged a demonstration that included Jim placing Cheryl Miller on a sleeping bag in Barr's doorway and conducting a spasticity demonstration, and later accompanying activists chanting from inside the office. Jim Miller ended up being arrested and Cheryl was placed back in her wheelchair, with no padding underneath her, by Capitol police. After a couple court appearances, and faced with the judge's refusal to hear about Cheryl's condition and why they were there, Jim accepted a plea bargain where one charge was dropped if he pled guilty to protesting at the Capitol on March 1, 2000. He received a sentence of paying $50.00 to the victim compensation fund, along with a fine of $0 with no jail time, probation, or community service. Read an update about it on the cherylheart.org website here. The action received a fair amount of attention on various internet sites, and was the subject of a fine article by David Pace of the Associated Press that was published nationwide. D.C.#3 - More photos from the rest of the week in D.C.